I have collected knives since I was a Teenager and I now have approximately 300 collectible knives in my collection. Mostly, I collect fixed blades, lockbacks, and unusual knives although I do have a few pocket knives. I am a fan of Gil Hibben knives and have all of his fantasy series plus a few others. Knife Makers: I would like to showcase example of custom knifemakers. If you would like to be listed on my Custom Knifemakers page, please submit a link to your website, a photo of yourself, and some pictures of your work to webmaster@cartertown.com . Inclusion on www.cartertown.com is at the sole discretion of the administrator. When I started this website in May 2003, I had been collecting knives for about 25 years. Up until that point, I had been buying factory knives and stuff I found at yard sales and flea markets. I just bought whatever struck my fancy and I could afford. There is nothing wrong with that. Any collection should be something you enjoy and I do enjoy my knives. 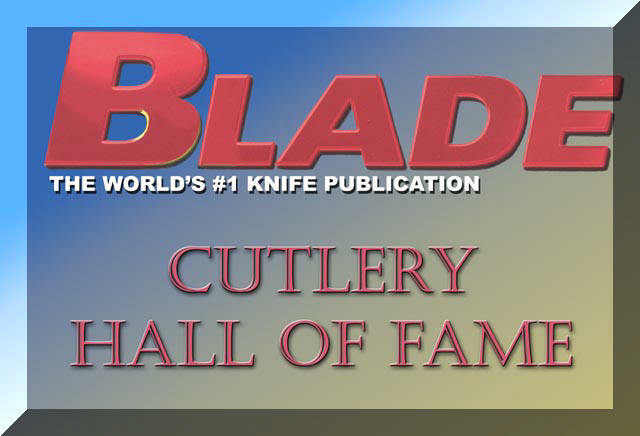 In the same year that I started this website, 2003, I also attended a knifemaking class with Gil Hibben. In the years since then, I have become a professional knifemaker and I have learned how much I didn't know about knives when I originally wrote these pages. So. I will now update this website a bit. One thing I have learned is that there are different categories of knife collectors. Many start out just as I did, collecting whatever you happen to find that you like and can afford. Many then go on to collect a certain style of brand (for me, it was Schrade cutlery and United Cutlery knives designed by Gil Hibben). When I first started collecting knives, I didn't even know there were handmade custom knives. Now, handmade knives are just about all that I buy. Some collectors collect as an investment. Investment collecting requires a keen knowledge of knives and knifemakers. Even then, it is something of a gamble just like investing in the stock market. You have to predict what will be valuable or "hot" in the future and try to buy low and sell high. Years ago, Ebay was an invaluable source for finding collectable knives. Now, you are not likely to get bargain prices on many knives because of the number collectors you are bidding against. Flea markets and yard sales can be gold mines for collectors and many of my knives have come from those sources. For retail outlets, you can't beat Smokey Mountain Knife Works. Atlanta Cutlery www.atlantacutlery.com is another good source for knives and swords. For handmade knives, go to the knife shows and frequent the several good knife forums on the Internet as most have a buy/sell area. Many people who get into knife collecting eventually move from buying only factory knives to collecting some custom or handmade knives. For clarification, a handmade knife generally means that the knifemaker personally forged and/or ground the blade, made other components, and assembled and finished the knife. A handmade knife is not necessarily a custom knife in the true sense of the word as it may have been one of many of a particular design and not made for any particular order. A custom knife is generally regarded as one that was made to order and is one-of-a-kind. Some people regard any handmade knife to be a custom knife and one-of-a-kind as no two handmade knives will ever be exactly alike. Custom knives are not to be confused with "customized" knives. Customized knives are generally factory production knives or kit knives that have been modified from their original design. This might include custom handles of exotic wood, bone, ivory or other material, engraving, scrimshaw art, or fancy file work. There is a lot of discussion these days about gray areas of defining what exactly is a handmade knife. A knifemaker may or may not do all of the involved steps himself or even in his own shop. (I use the reference to "he" in general. There are several very good female knifemakers out there.) A popular (busy) knifemaker may have an assistant or apprentice do some steps in making a given knife such as working on the handle or polishing the blade. Many knifemakers heat treat their own blades while other send them out of house to be heat treated. Some may make components such as blade blanks or guards using sophisticated computer driven automated CNC machines while other do everything manually by hand. It is common for one person to make a knife and another to embellish it with engraving or scrimshaw and yet another person make the sheath. New terminology is cropping up to deal with the blurring lines of "handmade" knives. "Sole Authorship" is being heard lately to define a knife that every step in creating the knife was done by the maker whose name is on the knife. "Mid-Tech" is sometimes used to define a knife that includes parts that were made by automated machines or purchased out of house. If it is important to you, ASK the knifemaker or seller. Well known custom knifemakers often have long waiting lists and their knives command big prices, often in the thousands of dollars. There is a very long list of master knifemakers, both living and deceased, whose knifes you see traded among collectors. 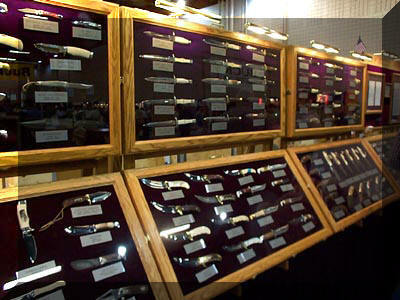 The best known and most sought after knives would include those made by Bill Moran, Bill Scagel, Rudy Ruana, Ron Lake, Bob Loveless, Tony Bose, Jimmy Lile, Gil Hibben, Buster Warensky, Jerry Fisk, D'Alton Holder, and many others whose experience and reputation earns premium prices for their handmade knives. There are a LOT of lesser known and new knifemakers out there who are doing incredible work but have not yet gained the reputation and their knives can often be purchased at bargain prices. It is important to define what you expect from your knives as your intentions should be a deciding factor in your purchases. Do you want to use the knife on a regular basis for camping or skinning? Is it an investment? Are you looking for "art" knives? Each has it's own place and it's own following of collectors. Buying knives for investment purposes is somewhat of a gamble as are most investments. A Bill Moran or Gil Hibben knife purchased years ago for a couple hundred dollars may well be worth thousands now. Blade Steel: There are many types of steel used in knifemaking including tool steels like D2, A2and 01, high carbon steel like 1095, a variety of stainless steels such as 440C, 154CM and S30V, and many other varieties like AUS8. In addition there countless varieties of Damascus steels which are made up of multiple layers of different types of steel forge welded together. There is a constant stream of new "super" steels being introduced every year. So what is the "best"? That is a never-ending debate. A lot depends on how you intend to use it and what is important to you. High carbon steel is generally harder and will hold an edge longer but it will rust if not maintained. Stainless steel has traditionally been a little softer but pretty much maintenance-free. Modern alloys are changing everything and new stainless steels are every bit as good as traditional carbon steels. If you are buying a collector piece for investment or an art knife, it really doesn't matter since the knife will probably never be used anyway. Blade Heat Treatment: How a blade is heat treated is absolutely essential to the quality of the blade. Each type of steel has it's own requirements for heat treating, quenching and tempering to achieve it optimum hardness, consistency and/or flexibility. Any blade is only as good as it's heat treating as far as being a functional blade. Good steel can be ruined by improper heat treating. Blade hardness is generally measured on the Rockwell scale with a Rockwell hardness of 57-60 being the general acceptable range for functional knifes. It is important to understand that harder is not always better in a knife blade. The harder the steel, the more brittle it gets and likely to break under impact or bending stresses. A good knife blade is a compromise between hardness and flexibility. Forged vs. Stock Removal: There is a never-ending debate about which is best. In my opinion, after doing a lot of research, it really doesn't matter. One is as good as the other if properly done. For clarification, hand forging means the knifemaker heats a steel billet and hammers out a blade on an anvil or using a trip hammer. A "stock remover" buys steel that has been forged in a factory and cut into bars which the knifemaker then cuts and grinds into a blade. Some people simply prefer a hand forged blade as an example of the knifemaker's skill in forging. Even the grinding process itself varies among knifemakers. Some use jigs to perfectly align the blade to the grinding wheel or grinding belt to insure perfectly straight and even grind lines. Others like Gil Hibben and myself grind freehand using no guides or jigs. As far as grinding, there is a variety of styles for grinding a blade as well as a variety of ways to bevel an edge. There are hollow grinds, flat grinds, convex grinds and chisel grinds. Each has it's own attributes and users often have their own preferences depending upon the knifes intended use. Blade Finish: Largely a matter of personal preference and esthetics, a blade may be finished in a variety of ways including hand rubbed, mirror polished, bead blasted, or powder coated. In general, mirror polished blades are more resistant to rust or pitting with age but will show scratches, smudges and fingerprints more. Hand rubbed finishes may show scratches but they can be rubbed out out with fine sandpaper or steel wool. Bead blasted or coated blades will usually have to be sent out to be refinished. Handles: Knife handles can be made from virtually anything including natural wood, horn, bone, ivory, and a wide variety of manmade materials. Functionally, some materials may hold up better under use than others. In reality, most handle materials are chosen for their appearance as much as their content. Granted, any material used should be strong enough to withstand normal use without cracking or coming off. Exotic woods such as rosewood or desert ironwood are durable and incredibly beautiful but fairly expensive. Natural materials like ivory (elephant, walrus tusk, or ancient wooly mammoth) are highly prized in knives but very expensive. Almost any natural material, with the possible exception of mother of pearl, can "move" over time. By "move", I mean swell, shrink, warp or even crack. Wood may shrink as it dries out or it may swell if dry and then exposed to high humidity. Stabilized woods reduce the problem but it can still happen. Bone and ivory will likely show cracks eventually. You will rarely find an antique bone or ivory handled knife with no cracks. The handle material alone in a single knife may cost the knifemaker well over one hundred dollars so it will add considerably to the cost of the knife. Bolsters, guards and pommels: These are generally made from brass, steel, or nickel silver but sometimes or materials such as copper, bronze, titanium or even gold and silver are used. Brass is the least expensive but it is a soft metal and will scratch easily. Titanium is very strong and lightweight but very expensive and difficult to work. The choice of materials is largely esthetic but the weight of the materials used does contribute to the overall balance of the knife. Fit and Finish: This is often how the quality of a handmade knife is judged. This refers to how well all of the knife parts fit together and how flawless is the finish of the parts. In general you are looking for things like how well the guard is fitted to the blade without any noticeable gaps. Is everything tight and precisely fit? Embellishments: Many knifes are embellished with intricate engraving, scrimshaw, carving, inlays, gold plating or even gemstones. The embellishments may or may not have been done by the knifemaker as there are several well known artists who do not make knives but often apply their craft to the knife. Fancy file work along the spine of the blade, handles, and other parts is an art in itself and adds beauty to the knife. Sheath: Sometimes the sheath is every bit as elaborate as the knife using exotic materials and beautiful tooling. Like embellishments, the sheath may or may not have been made by the knifemaker. There a lot of well known and highly respected leather workers out there making incredible sheaths. There are a number of knife forums on the internet that offer a wealth of information about knifemaking and knife collecting. A few of my favorites are www.bladeforums.com , www.knifenetwork.com , www.knifeforums.com, www.knifedogs.com and www.customknivesandguns.com . Below I have listed several of my favorite knife brands. The name of each brand is a hyperlink that you can click on to go to the manufacturer's Web page (or a prominent dealer if I could not find the company home page). The companies listed are the bigger, more recognized companies. There are countless smaller companies, too numerous to list, such as Spyderco, Busse, Cold Steel, Mantis, CKRT, Bark River, and many more. In addition there are a number of full-time custom knifemakers who have ramped up their production to put out quite a few knives every year. Case: Probably the most recognized brand in the United States, Case has made their extremely high quality knives in Bradford, PA for generations. The quality is unsurpassed and hundreds of models are available. They mainly produce folding pocket knives but do make a few fixed blades and several special limited-edition knives. United Cutlery: One of the biggest mass-producers of knives. Most are are now made in China but don't let that necessarily put you off. Although many Asian and Middle Eastern knives are often known for poor quality and workmanship, United has produced some very good knives. Gil Hibben's knives are produced by United and if you have ever held one, you know the excellent workmanship involved. United Cutlery can be one of the best buys for the money. UPDATE December 2006: United Cutlery filed bankruptcy and closed down. The company's assets, designs and trademarks were purchased by the owners of Bud-K and have continued, and even expanded, the United Cutlery line. Schrade: A long-time manufacturer of very high quality knives in New York. Famous for their large lockbacks, trappers, and "Old Timers", there is a large selection of various types available. The scrimshaw series offers beautifully engraved handles. I'm sorry to report that Imperial Schrade has gone out of business after nearly 100 years of making quality knives. Taylor Cutlery has purchased the Schrade name and is continuing to make "Schrade" knifes including many of their traditional patterns although most are now made in China. Camillus: A sister company of Schrade also located in New York. Camillus has been famous for high quality knives for 100 years and employed several 2nd and 3rd generation knifemakers. Camillus knives have always had a presence in the military. I'm sad to report that in early 2007 Camillus also closed down. Like Schrade, the "Camillus" name was purchased by another company and they are now making "Camillus" knives in China. Boker / Tree Brand: (I cannot find a company website for Boker but here is a dealer who carries a lot of Boker knives http://www.opticsplanet.com/knives.html .) Solingen,Germany. Boker and Tree Brand knives are some of the finest examples of craftsmanship and attention to detail around. Nothing fancy, just really good knives that seem better balanced and feel better in the hand than most other knives. Buck: Excellent variety of hunting, lockback and pocket knives. Very good quality and usually have beautiful wood handles. Buck is one of the few large cutlery companies still operating in the U.S. although even they are now having some of their knives made overseas. Puma: Excellent hand-made German knives. Mostly small hunters and folding knives. Frost: Usually cheaper mass-produced knives. Lately, they have been producing a lot of fantasy knives. Decent quality for the money. *Note: Frost was once part of Parker-Frost before they split and each started their own companies. Parker-Frost knives have become highly collectable. Kissing Crane: Produced by the Robert Klaas factory in Solingen, Germany, where master cutlers have been crafting quality knives for over 175 years. This line of traditional pocketknives, hunting, and folding knives are assembled and polished by hand, making each knife a work of art. They also make a fine line of automatic stilletos. These knives have been a favorite for many generations and continue to be in strong demand by the serious collector. Coleman: The lantern people. They made decent utility and pocket knives. I am not sure if they actually made them or just branded another manufacturer's knives. Western: Cheaper bowie and other knives. Fair to good quality for the money. Smith & Wesson: The gun people. They made a few very nice high quality knives. Mostly smaller tactical style knives. A unique feature on some is the Pacmyer style rubber handles like the grips on some guns. Colt: The other gun people. Very nice fixed blade hunting knives and folding lockbacks. They often offer special limited edition knives commemorating notable eras of the company's history. Beretta: The Italian gun people. Some very good quality hunters and folders bearing the recognizable company logo. Randall Knives: If you have a lot of money and patience, Randall knives are excellent knives and an excellent investment. Handmade in Orlando, Florida, Randall knives are legendary products of the company started by Bo Randall and now run by son Gary Randall. Many of their knives run in the $300-$500 range. I mentioned patience. As of this writing in January 2006, they are taking orders to be filled in June 2010! Browning: A good line of quality knives, many designed by well known master knifemakers. Other brands that I keep an eye out for include Camillus and Ka-Bar (maker of many US Military Knives). These days, they are a number of "mid-level" knife companies operating in the U.S. These include Randall, Busse, Spyderco, Cold Steel, Chris Reeves, Al Mar, Great Eastern and many others. Some of these companies do have components, or the entire knife, made overseas. Some, such as Randall, still claim to hand grind or assemble the knives. United States: The are a few U.S. companies producing very good quality knives including Case and Buck. Beware that some companies manufacture some of their lines in the U.S. and farm out other lines to factories in China or Taiwan. Germany: Long regarded as some of the best knife makers in the world, almost any knife made in Germany will be very good quality. Look for the stamping "Solingen". Switzerland: The Swiss army knife. Enough said. Italy: Famous for Italian stilettos and switchblades. Spain: Great swords have come out of Toledo Spain for centuries. Companies such as Muela make excellent knives that are often used in military and police roles. Europe: I have found a few good knives of European origin but they seem to be rare in the United States. Many highly collectable bowie knives were made in Sheffield, England in the 1800's and early 1900's by companies such as S. Pearson & Co., Fragg-Shefield, and Wm. Jackson. Pakistan: Typically junk. Pakistan exports a lot of knives and swords to the United States. They might be worth purchasing just for novelty since they are usually very cheap but the craftsmanship is sorely lacking. 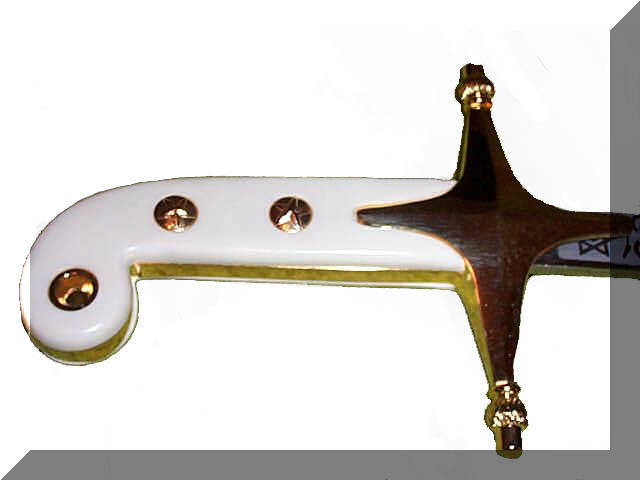 A common sign of Pakistan knives is poor-quality brass work with excessive pitting a common characteristic. Blades are usually a little rough and don't exhibit the smooth, mirror-polish finish of better knives. India: More junk. Similar to Pakistan. China: Usually junk. Usually low quality steel. Japan: Some excellent blades come out of Japan as well as cheaper, lower quality blades. The Japanese have been making some of the best knives and swords for centuries. Mexico: More junk usually. I have seen a few decent quality knives from Mexico. A class in itself, military knives are plentiful but yet collectable if you know what you are looking for. Surplus military issue knives, swords and bayonets can often be found at good prices through dealers such as The Sportsman Guide, US Calvary and others. Foreign military items are often good bargains, particularly Swiss and Russian army issue. I have several bayonets from around the world that are very interesting. Weight - Feels good and strong in the hand. Well balanced front to rear. Handles - High quality wood, stag, bone, or metal. Plastic is usually a no-no for me. No gaps in the scales. Tight - Everything is pinned tightly together. Workmanship - I look for extra touches such as "worked" backs on the blades nickel silver bolsters. Blade: Older knives typically used high carbon steel which is very hard and keeps an excellent edge but is prone to rust and pitting if not kept well oiled. Newer knives are usually made with stainless steel which is much easier to care for. There are also Damascus blades which are made from many layers of various types of steel and have a very unique pattern when ground down through the layers. A rather unique and fairly expensive newer variation is ceramic blades which are reputed to hold a fine edge much longer than steel and of course you don't have to worry about rust but they are very brittle and usually have to be sent back to the factory for sharpening.. Finally, a note to collectors: BEWARE OF FAKES! There are a lot of scam artists out there selling fakes on Ebay, other online auctions and even at gun and knife shows. Sometimes they are modern copies of knives supposedly made by famous makers. More often they are supposedly antique knives. I have seen many beat up, crudely made pieces of crap sold as historic antiques for big prices. Think about it. Even in medieval times cutlers and sword makers took great pride in their work and produced exquisite craftsmanship. Most cutlers served apprenticeships under masters of the craft. They did not produce rough, crudely made junk. Blacksmiths seldom made knives. Many of these fakes have some fantastic story attached to it. I'll qoute knife authority Bernard Levine on this one; "Buy the knife, not the story". Nearly all accomplished knifemakers have certain telltale traits and styles that identifies their work. Do your homework and research before spending serious money of collectible knives.